Seoul is full of novel indoor attractions for foreign tourists, from board game cafes and escape rooms to one-person karaoke booths. One of the most comforting of these sites might be the sheep cafe Thanks Nature, located just in front of Hongik University in the Hongdae district. The cafe, sitting in a sunken garden-like lower story, houses in its outdoors enclosure two sheep brought from Gangwon Province’s Daegwallyeong Sheep Farm. At the farm, sheep are bred only as petting animals and roam freely in the pastures, according to an official there. At Thanks Nature, visitors can pet or feed the sheep after ordering coffee or waffles at the indoors cafe. A family from Hong Kong with two young boys was visiting the cafe last Friday. The sheep, generally gentle by nature, skipped around and lapped feed out of the tots’ hands. The cafe managers said they pay careful attention to the sheep’s environment, making sure their fenced-in rooms are tidy and equipped with food and water. 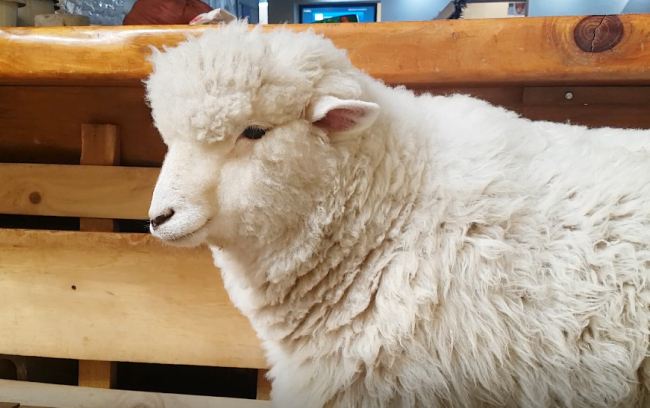 To minimize any stress the sheep may receive from excessive up-close interaction with cafe visitors, the sheep are changed once every year, Thanks Nature’s owner Lee Kwang-ho said. The ones at the cafe are taken back to the farm, and two new sheep are brought in.